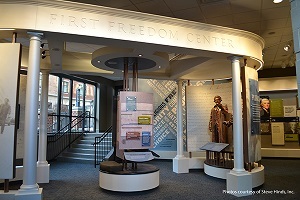 The purpose of a visitor center is different from that of a museum exhibit. Where the later offers a detailed story, the purpose of the visitor center more often conveys general information about what can be experienced on-site. While the design features and materials employed are the same as used in museums, durability is even more of an issue due to the multi-use nature of the environment. Designs for visitor centers often call for a great variety of technical disciplines and materials. Casework, interactivity and natural science features may all be combined to deliver the site’s message. CMS has experience with all manner of static and interactive exhibit techniques and can create proper environments for both mounts and live specimens. CMS has extensive experience working with A/V and interactive producers, providing the engineering, fabrication and installation of the structures necessary to convey your message effectively to your visitors.